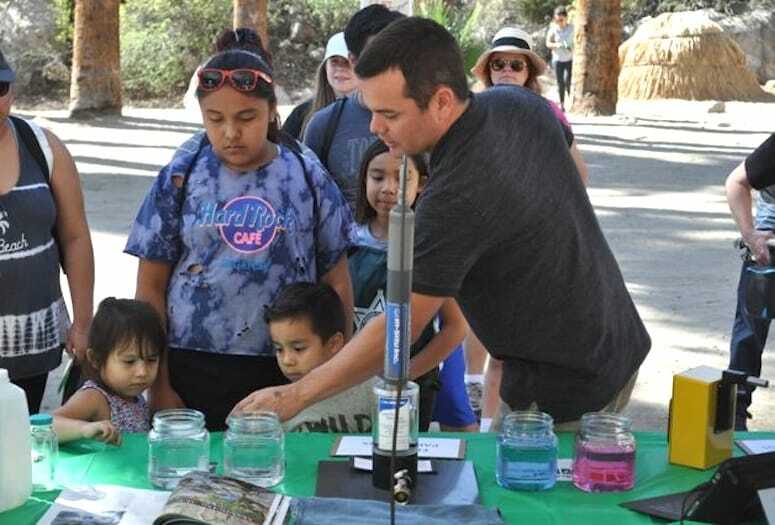 Kids learn about the environmental aspects of maintaining clean water to the history of the Agua Caliente Band of Cahuilla Indians. Coachella Valley students have a unique opportunity to experience the rich history of the Agua Caliente Band of Cahuilla Indians in a classroom that has no walls. The Tribe’s Junior Ranger Program brings students ranging from preschool to college level to Indian Canyons in Palm Springs, a picturesque setting that allows full interaction of the surrounding terrain, floral, and fauna. All three Coachella Valley school districts participate in the Junior Rangers Program, and the Tribe reaches out to disadvantaged areas with its bus grant program that provides transportation to Indian Canyons. This education process has been going on for decades dating back to when Tribal rangers visited schools to share their knowledge. These tribal experts, coordinated by Agua Caliente Tribal Ranger Raven Longbow, take groups on the 1-mile Andreas Canyon Trail and point out the rushing waters and plant life that led to the Tribe’s survival for thousands of years. The Indian Canyons are open to the public daily from 8 a.m. to 5 p.m. Oct. 1 through July 5 and weekends from July 5 through Sept. 30. Cost is $9 for adults, $7 for seniors, and $5 for children ages 6-12. Visit indian-canyons.com for more information. Please note: Hours of operation and ranger-led tour schedules are subject to change. VIDEO: Experience a day at the Junior Range Expo where families experience a wide-range of activities related to the history and continued growth of the Agua Caliente Band of Cahuilla Indians.